A new study assessing the underwater soundscape off Southern California found that blue, fin and humpback whales experience a range of acoustic environments, including noise from shipping traffic as well as quieter areas within a national marine sanctuary. The study appeared in a special issue of Endangered Species Research focusing on ocean noise. 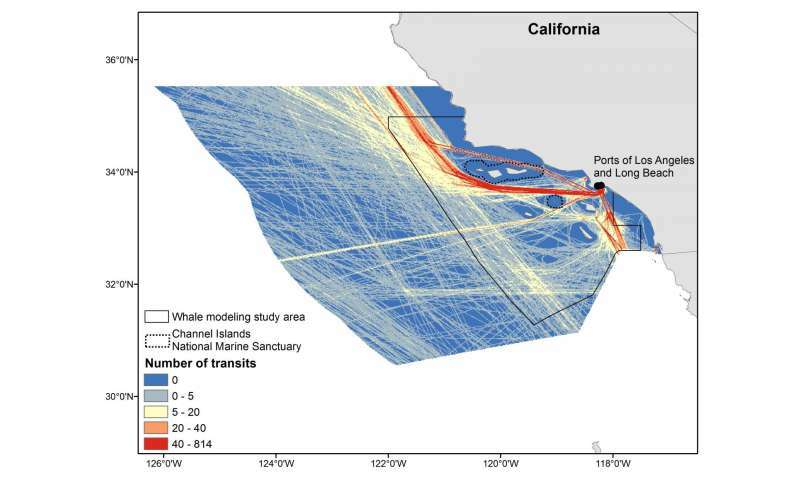 "Our research provides a framework that can be used to evaluate how shipping traffic affects acoustic environments and a tool to explore existing and future management strategies," said Jessica Redfern, a research biologist at NOAA Fisheries' Southwest Fisheries Science Center in La Jolla, Calif., and the lead author of the study. Other authors include scientists from NOAA's Office of National Marine Sanctuaries and Office of Science and Technology, the National Park Service and private consulting companies. The analysis is a case study in NOAA's Ocean Noise Strategy Roadmap, which describes methods of measuring and assessing the impacts of ocean noise. Blue whales feed in Southern California waters from about June to October, while humpback whales feed in the area from March to November and fin whales have been found there year-round. Underwater shipping noise occurs at low frequencies and these three species of large whales are low frequency hearing and communication specialists. Therefore, the potential for low frequency noise to mask communication has been identified as a primary concern. 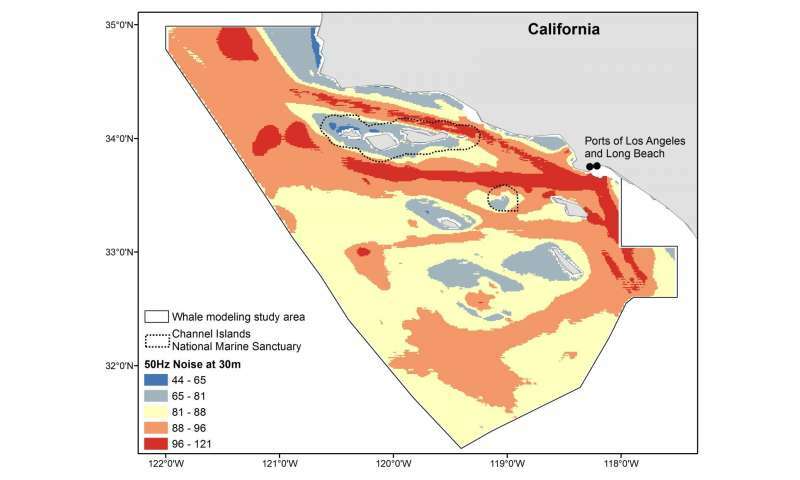 The study used U.S. Coast Guard data on ship traffic from 2009 to estimate sound levels throughout Southern California waters, including areas south and west of Point Conception and in the Channel Islands National Marine Sanctuary. The analysis found that about 95 percent or more of the study area (see the maps) contained noise exceeding references for preindustrial levels. The analysis also found elevated noise levels in important whale feeding grounds and other areas expected to have higher whale densities, especially the Santa Barbara Channel, areas offshore of Point Conception, west of San Miguel Island and south of San Miguel Island and Santa Rosa Island. The analysis also found that some important blue and humpback whale feeding areas overlap quieter coastal waters near Point Conception and in the Channel Islands National Marine Sanctuary. The analysis found both noisy and quieter areas in the Channel Islands National Marine Sanctuary. Noisier areas occur primarily where an established shipping route intersects the Sanctuary's boundaries. Apart from this area, the sanctuary is relatively quiet compared to the rest of the study area (see the maps). Although the Sanctuary does not regulate noise, the quieter areas occur where the Sanctuary is designated as an area for ships to avoid to reduce risks of grounding and pollution. This designation demonstrates that there may be effective strategies to mitigate the risks of noise to marine species, researchers said. "Noise levels appear to be lower within some areas of the Channel Islands National Marine Sanctuary, perhaps providing some respite to whales who have to live in an increasingly noisy ocean," said Chris Mobley, Sanctuary Superintendent. "This analysis framework will help guide our on-going effort to protect whales from direct and indirect interactions with ships." 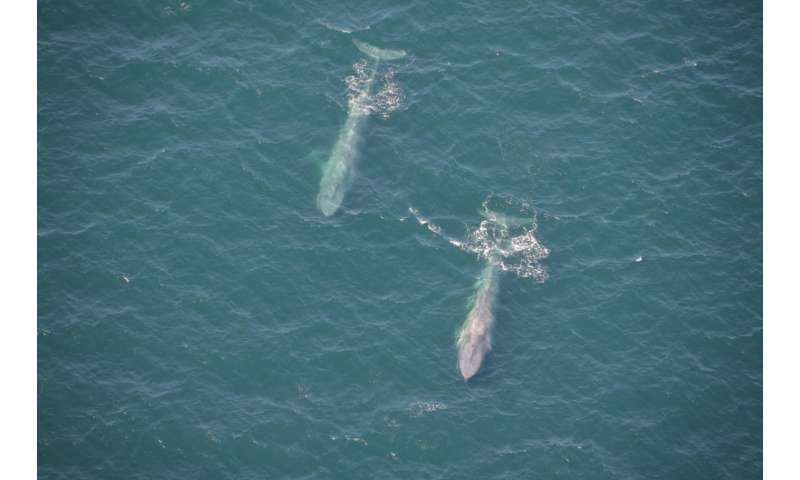 Blue whales off Southern California. Credit: Jessica Morten, Channel Islands National Marine Sanctuary, National Ocean Service, NOAA.